Ok guys. 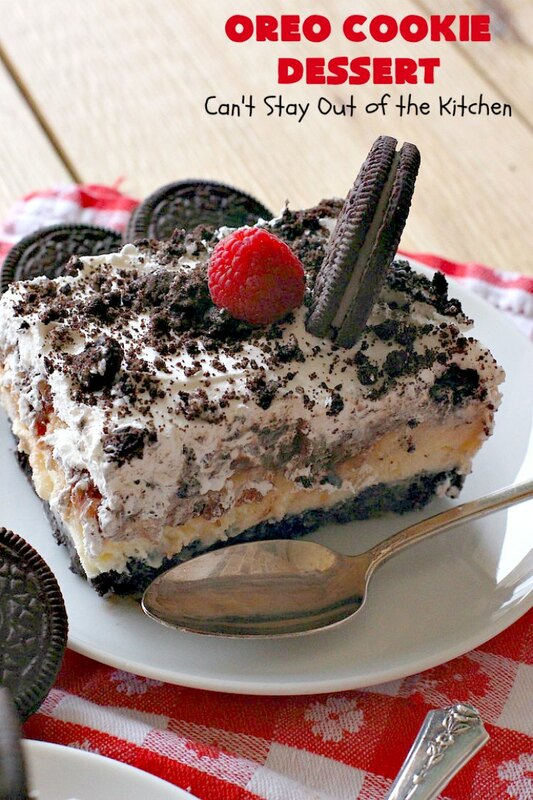 Oreo Cookie Dessert will rock your world! No kidding. This is one of the best desserts I’ve ever eaten. It has a luscious Oreo cookie crust. 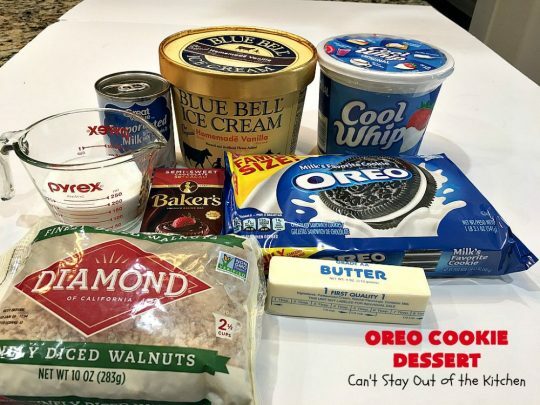 The next layer is a half gallon of Blue Bell vanilla ice cream. The third layer is a homemade fudge sauce layer with walnuts. Then the dessert is topped off with Cool Whip and more crushed Oreos. Oh my. If you want rich, if you want decadent, if you want fantastic, you have it with Oreo Cookie Dessert. I have my neighbor, Linda, to thank for this spectacular recipe. She invited us over for dinner last April. John had done some work helping her restore pictures she had lost on her computer. She served the two of us a fabulous 9 item dinner. We were blown away. What was on the menu? Amish Chicken and Noodles, Fried Green Beans, Baked Pineapple, Glazed Carrots, Favorite Fruit Salad, Deviled Eggs, Dinner rolls, Boudoin balls (a Cajun delicacy brought back from Louisiana) and Oreo Cookie Dessert. Let me tell you, we enjoyed every single mouthful of that dinner and had seconds of almost everything! We were stuffed to the gills by the time we left but everything was so, so good. 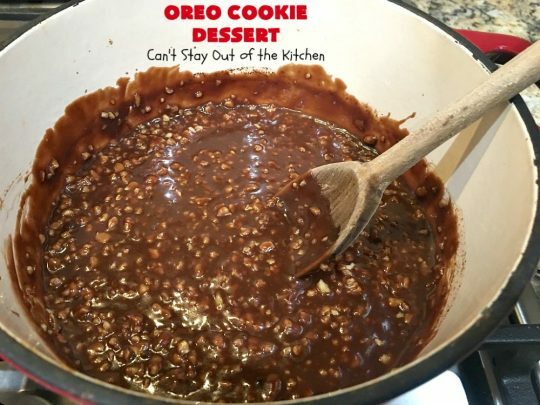 I’ve made all the recipes from that meal that Linda gave me except for this dessert. I copied several hundred of her recipes and have made about ten or twelve so far. Every one of Linda’s recipes have turned to gold in my opinion. 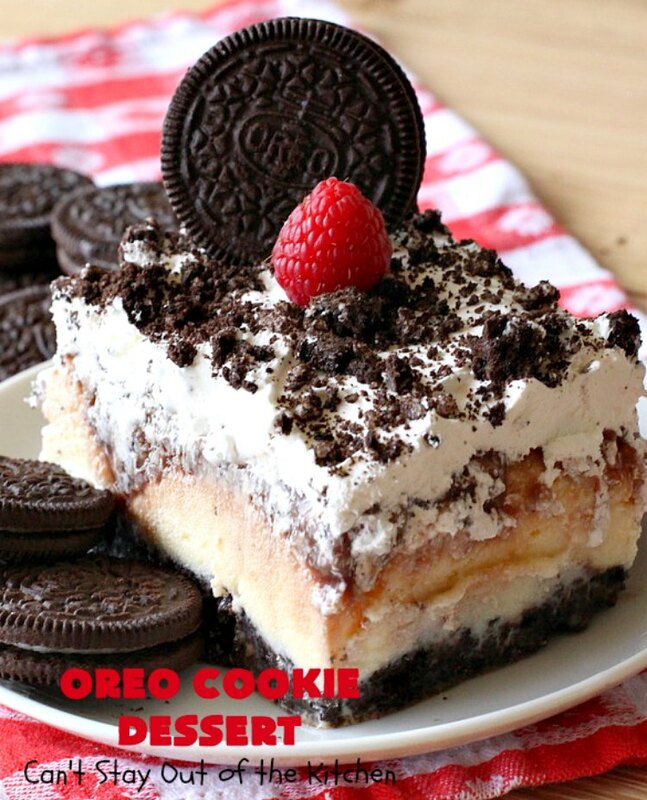 This Oreo Cookie Dessert is no exception. 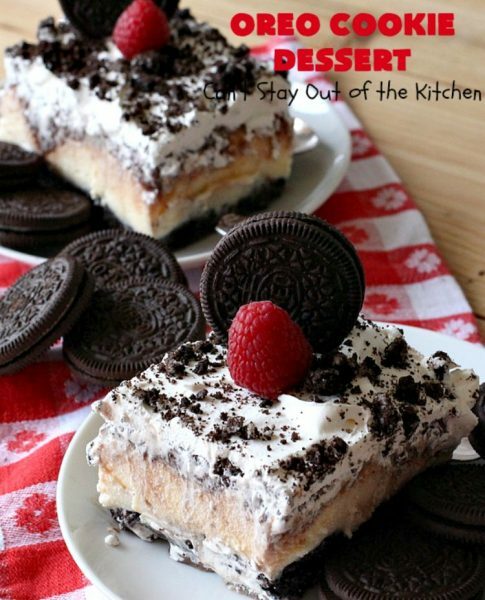 Seriously, this dessert is to die for. If you’re looking for a way to wow your spouse for Valentine’s Day, this is it! It’s a terrific dessert for company. It’s left in the freezer until you’re ready to serve it. So it can be stored in the freezer for several weeks or months before you need it, if necessary. You can even make it now for Easter if you wanted to! Regardless of when you make it, you’ve got to make this Oreo Cookie Dessert soon. All of your guests will be salivating. Don’t be surprised when everyone wants another piece of dessert….no matter how stuffed they are from a meal. 🙂 Yep, this dessert will certainly knock your socks off. So be prepared. This dessert is rich, decadent and addictive. Bring it on! 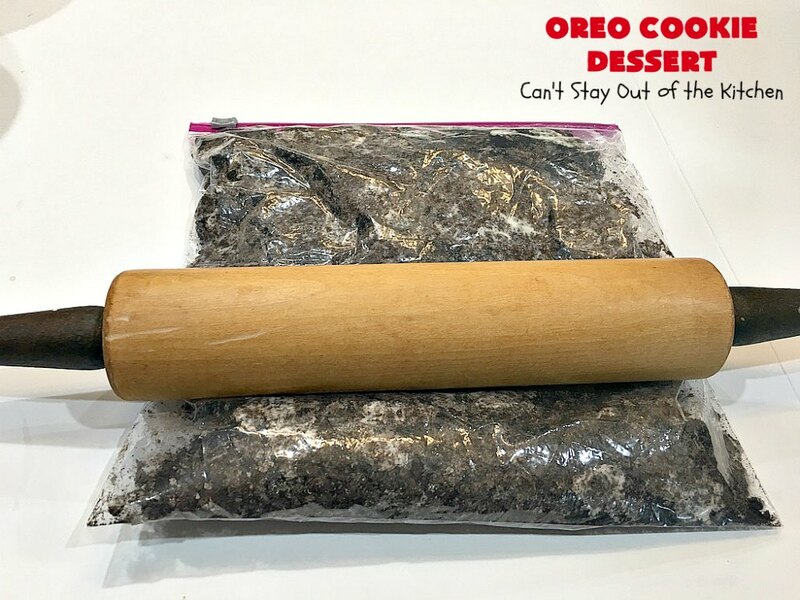 Oreo Cookie Dessert will rock your world! 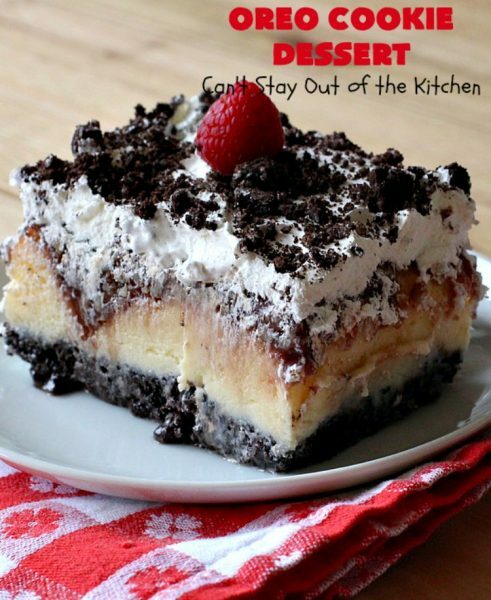 Every bite of this heavenly dessert will have you drooling. Place Oreos in a zip lock bag. Crush into fine crumbs with a rolling pin. 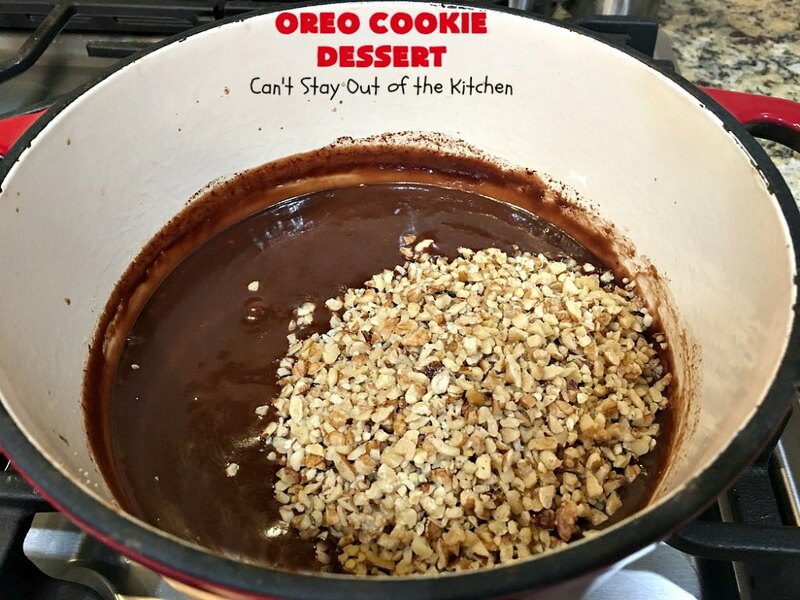 Pour crumbs into a mixing bowl. Reserve about 1/3 cup crumbs for later use. To remaining crumbs in bowl, add melted butter. 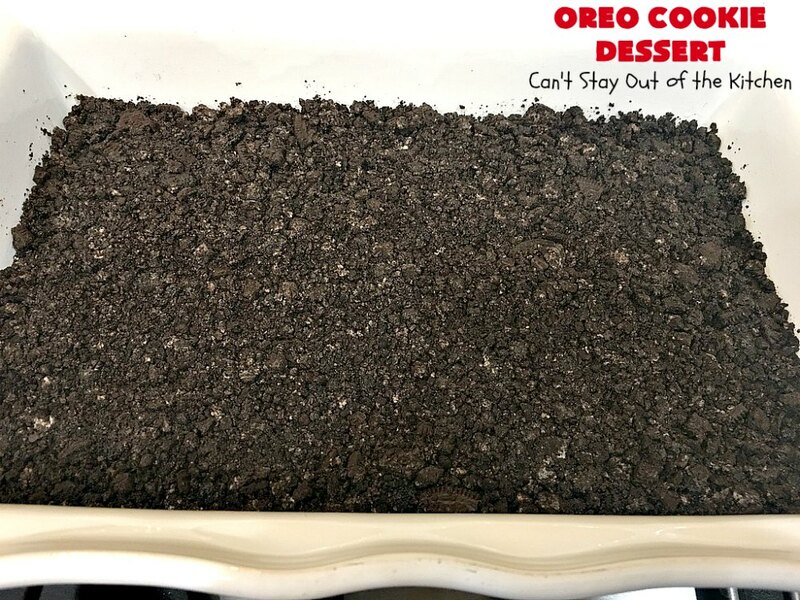 Press crumbs into a greased 9×13″ glass baking dish. Bake at 350 for 5 minutes. Cool completely. This will probably take about 30 minutes. 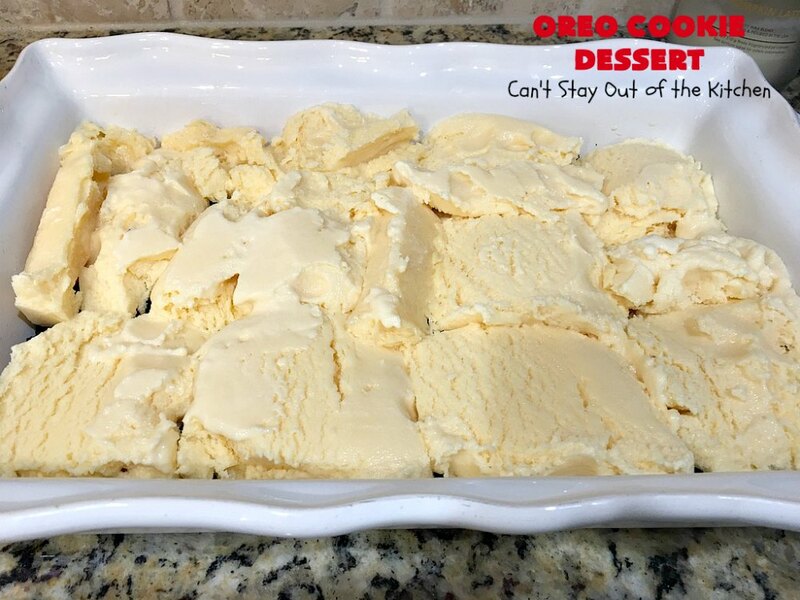 Cut ice cream into 5/8″ pieces. 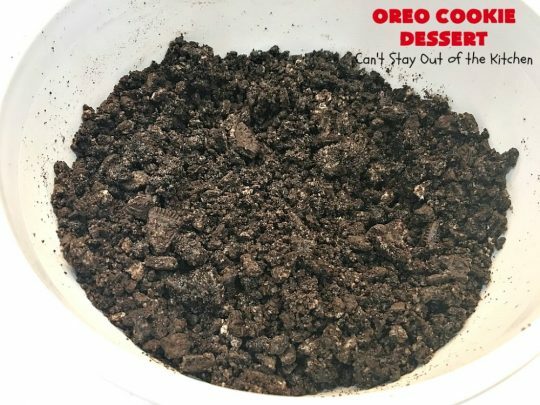 Spread ice cream over cooked but cooled Oreo crust. Cover with plastic wrap and place in freezer while making the sauce. 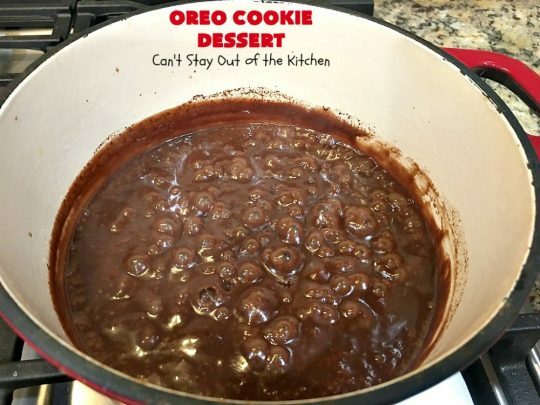 Over low heat in medium sized saucepan, melt chocolate, sugar and evaporated milk. Cook and stir until thick, about 10-15 minutes. Remove from heat. Add walnuts. Stir to combine. Cool completely. I placed the sauce in the refrigerator for 30-40 minutes to cool it more quickly. Once the fudge sauce has cooled completely, spread it over top of the frozen ice cream layer. Cover fudge sauce layer with Cool Whip. 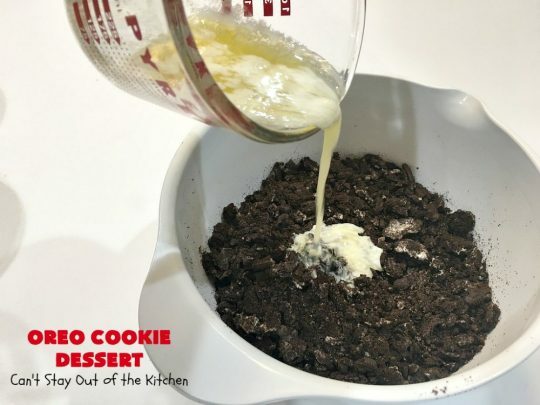 Sprinkle with remaining Oreo Cookie crumbs. Freeze dessert until ready to serve. 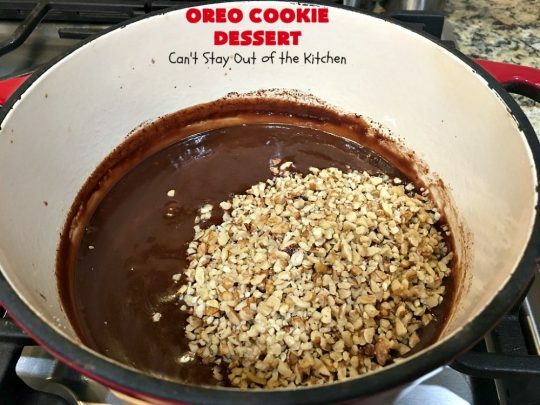 Serve dessert garnished with additional Oreo cookies, if desired. 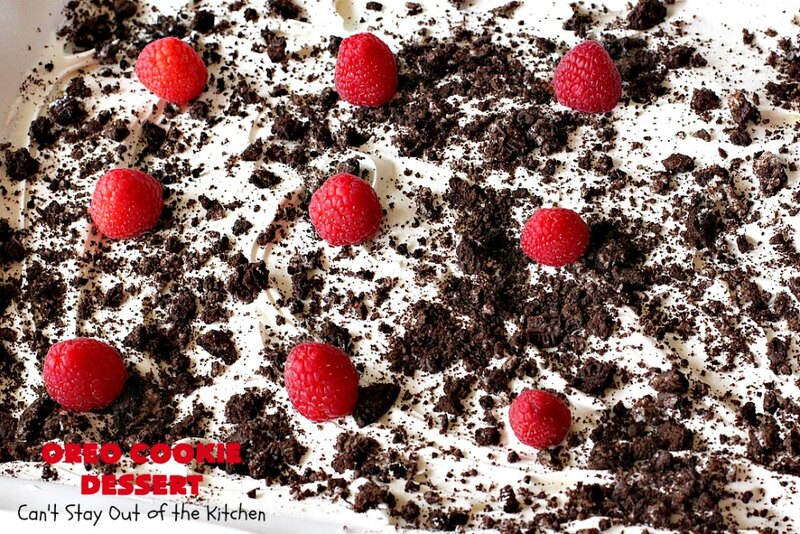 Our company raved over this luscious dessert. 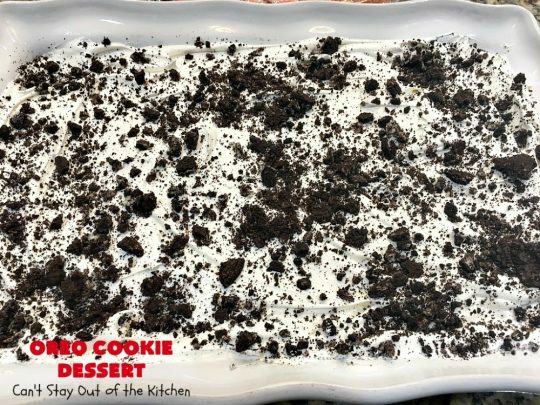 Oreo Cookie Dessert will rock your world! The bottom layer is crushed Oreos. The second layer is Blue Bell Vanilla ice cream. The third layer is a homemade chocolate fudge sauce with walnuts. 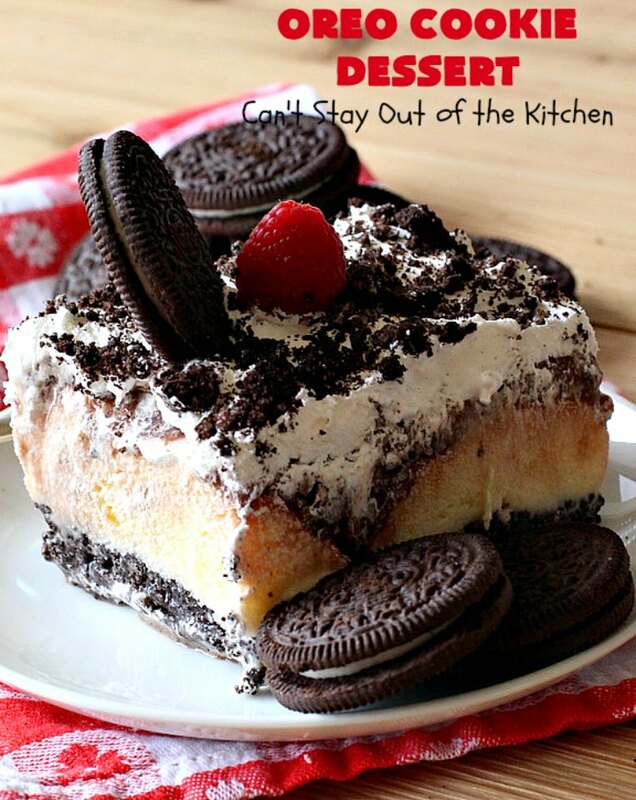 Then it's topped with Cool Whip and crushed Oreos. This magnificent dessert will wow all your friends and company. It's perfect for Valentine's Day or other holidays. Everyone will be drooling over this mouthwatering, sensational dessert! Reserve 1/3 cup crushed Oreos for topping; set aside. 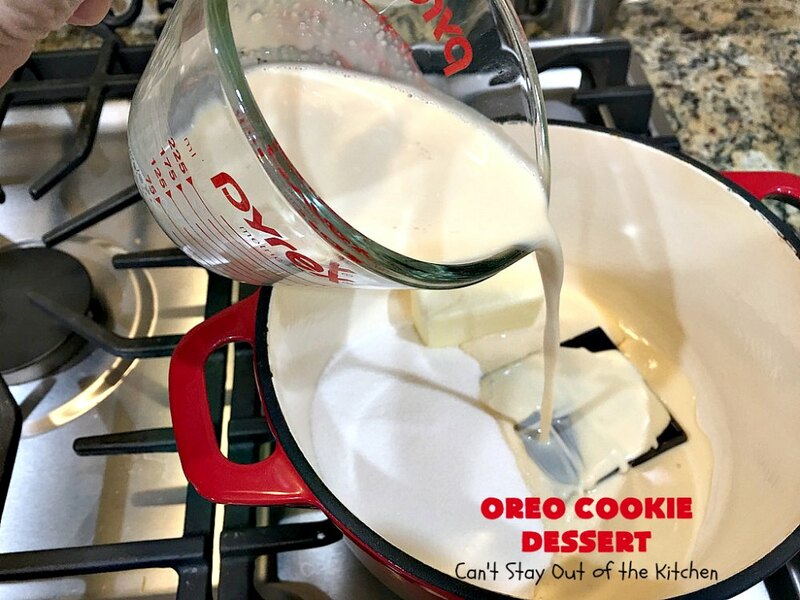 Mix together crushed Oreo cookie and ¼ cup melted butter. Press into a greased 9x13” glass baking dish. Cool completely! This will probably take about 30 minutes. Cut half gallon of vanilla ice cream into 5/8-inch slices. 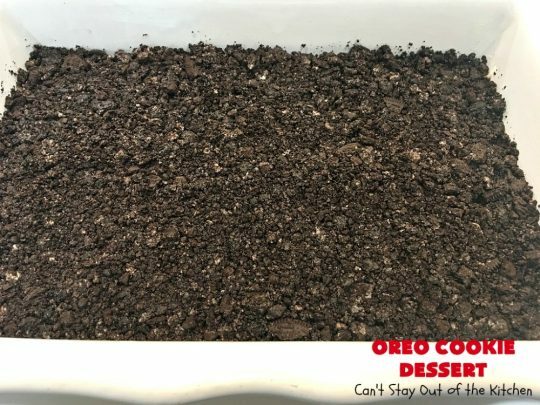 Spread over the baked but cooled Oreo crumb crust. 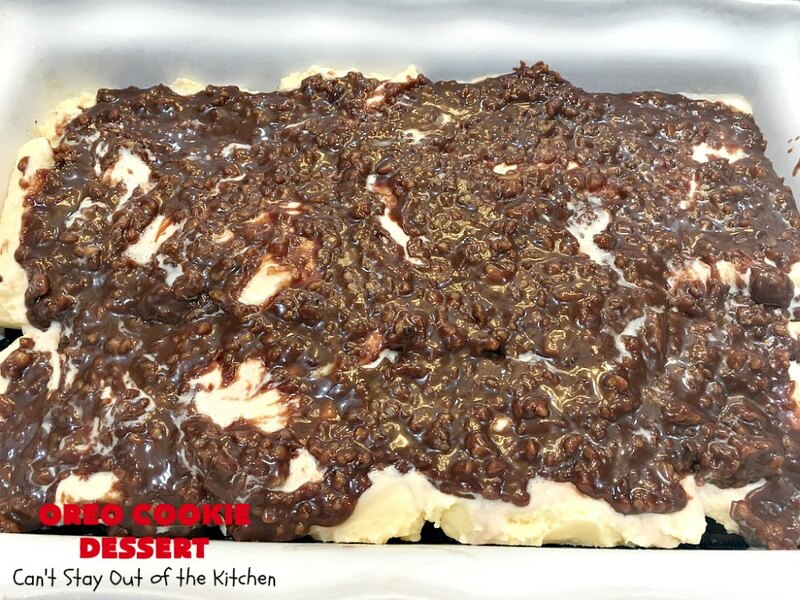 Cover with plastic wrap and place dessert in freezer while making and cooling the fudge topping. Topping: Place the chocolate square, butter, sugar and canned milk in a small to medium saucepan. Cook and stir until thick, over low heat. Add nuts and cool! (See note below). Pour cooled chocolate sauce over frozen ice cream layer. Cover chocolate sauce with Cool Whip. 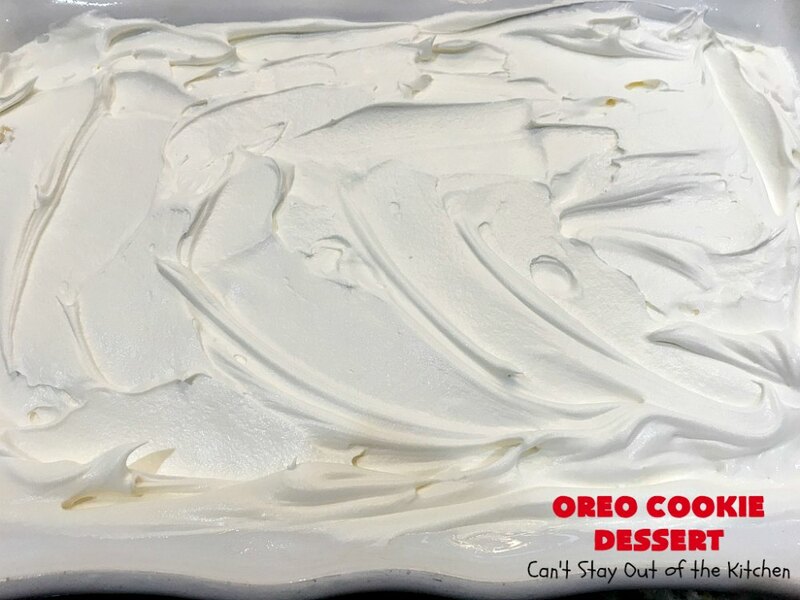 Sprinkle some of the reserved crushed Oreo cookies over the Cool Whip. NOTE: To quick cool the sauce, I placed the hot saucepan in the refrigerator for 30-40 minutes. 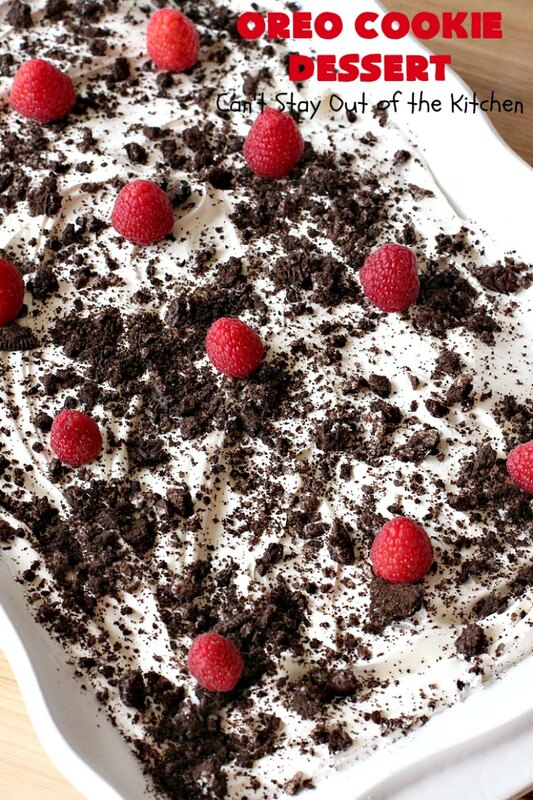 Chocolate lovers will go crazy over this amazing dessert. Oreo Cookie Dessert is a dream. Every bite will have you drooling. 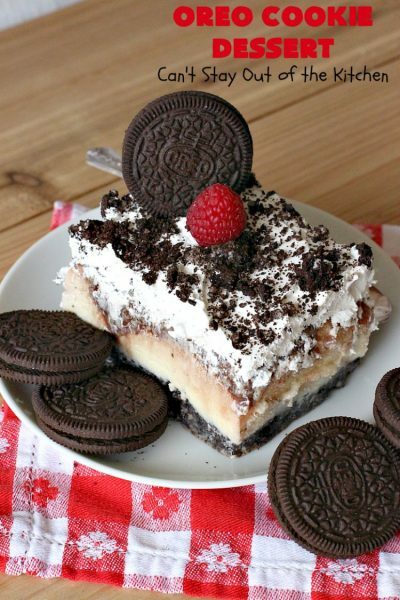 If you enjoy Oreos, you’ll love this dessert!